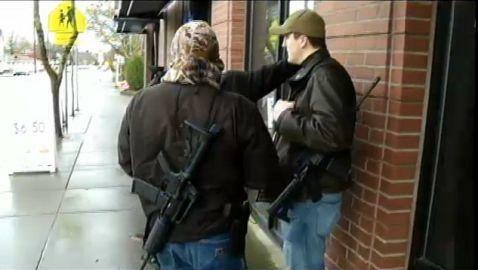 On Wednesday of last week, two men from Portland tried to raise gun rights awareness by walking around the streets of the city while carrying assault rifles. The two men, Warren Drouin and Steven Boyce, caused multiple people to call 911, according to Sgt. Pete Simpson. They were trying to show how people can carry guns and not cause problems while doing so. He also told the television station that he was hoping people would approach them to talk instead of calling 911. Drouin also has a channel on YouTube, where he goes by the name “Marked Guardian” to explain his thoughts regarding gun rights. His channel has close to 100 videos that show him walking around public places while carrying a loaded assault rifle on his back. In the videos he also has a pistol on his side, in plain view of everyone, according to KGW-TV. Drouin is very well known to law enforcement officials in the Pacific Northwest, especially in Medford, Oregon. The officials from the 103-member police force in Medford simply call him ‘Warren’ when they talk about their meetings with Drouin. Drouin is so well known in the area that officers receive training tailored specifically on how to handle Drouin and other people involved in the open carry movement. 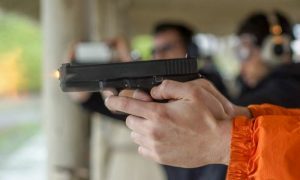 The movement promotes the rights to carry guns openly in public. The deputy police chief of Medford, Tim Doney, said that not all those who carry a weapon openly will be benign like Drouin.